The Center for Otology and Restorative Hearing Surgery is directed by Dr. Ronen Nazarian, a fellowship-trained otologist and skull base surgeon skilled in treating dizziness and hearing loss. Profound hearing loss has made it progressively difficult for Norman to function in the world. Hearing aids were ineffective and he was told there was nothing that could be done. Norman began to withdraw from society until he crossed paths with Dr. Ronen Nazarian. 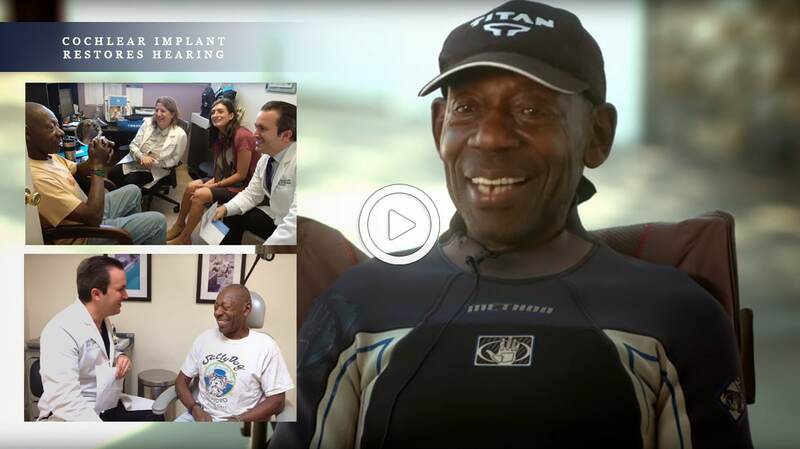 Norman's life is forever changed as Dr. Nazarian restores his hearing by surgically implanting a tiny computer in Norman's ear called a cochlear implant. Dr. Ronen Nazarian is the Director of Otology and Restorative Hearing Surgery at Osborne Head and Neck Institute in Los Angeles, CA. He is board-certified in Otolaryngology-Head and Neck Surgery and has completed fellowship training in Otology and Skull Base Surgery. Dr. Nazarian was raised in Los Angeles, completing his undergraduate education at UCLA and medical school at USC. In order to have a diverse clinical experience, he pursued residency training in Otolaryngology-Head and Neck Surgery at the University of Miami Medical Center and Jackson Memorial Hospital in Miami, Florida. It was here where Dr. Nazarian trained in one of the busiest cochlear implant programs in America, seeing first-hand the daily gratification of restoring a person’s ability to hear. He decided that he wanted to become an expert in hearing surgery, and pursued an additional year of training in otology and skull base surgery. Choose a topic or search this website for information about a variety of ear and hearing conditions, as well as treatment options and procedures. Choose a topic for information about a variety of ear and hearing conditions, as well as treatment options and procedures. The human ear is a miraculous and complex organ, responsible for many functions that are vital to a person’s quality of life. Hearing is the most recognized of these functions; however, the ear is also responsible for balance and spatial orientation. The Center for Otology and Restorative Hearing Surgery at Osborne Head and Neck Institute is focused on the care of medical and surgical problems of the ear. Our goal is to restore lost hearing and balance in those who have suffered a loss. 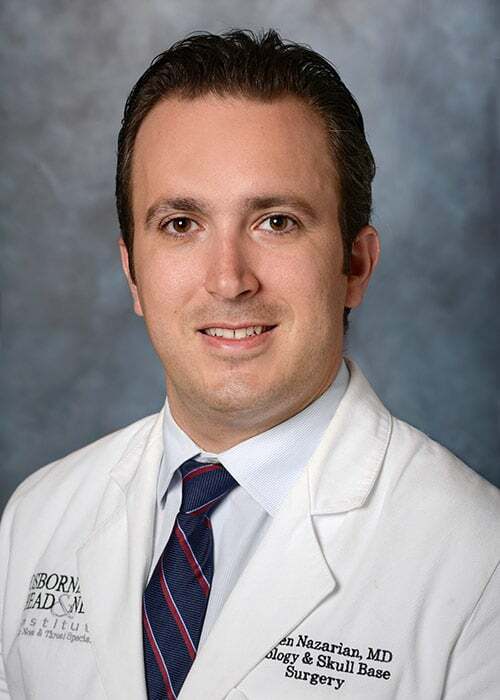 Ronen Nazarian, MD, is a board-certified Ear, Nose and Throat physician who has completed additional fellowship training in otology, neurotology, and skull base surgery. Otology is the specific study of the ear and base of skull. Fellowship training enables him to be proficient in the diagnosis and treatment of complex otologic problems. He specializes in medical and surgical care of ear disorders. Do I need an otologist or an audiologist? An otologist is a physician who is skilled in the evaluation and treatment of ear disorders and problems with hearing or balance. An audiologist is a care provider who helps the otologist diagnose, monitor, and treat issues such as hearing loss and dizziness. The audiologist also dispenses hearing aids. An audiologist is an important team member to incorporate once diagnosis has been established by the otologist. Diagnosis and treatment, both surgical and non-surgical, are established by the otologist, who is the physician specialized in the care of ear disorders. Having ear surgery and finding the right surgeon to perform your procedure can be stressful. From the worries of possible discomfort, hearing damage, and recurrent issues, it is always in your best interest to get a second opinion. Remember, most ENT surgeons are generally trained and may not have the specific fellowship training for complex and advanced ear problems. At the Osborne Head and Neck Institute, Dr. Ronen Nazarian is proficient and trained to handle the most complex ear cases. He will take the time to explain your treatment options and the plan is tailored to your specific case. "From day one, he knew the problem and and how to fix it. I ended up scheduling surgery with him. The surgery was not bad at all and I had minimal pain. Dr. Nazarian even called me after surgery to make sure I was doing well. He even sent me a get well card. He is such a great doctor. I am so happy to be able to hear again! I have no pain, no ear discomfort and I am doing great!"